Telford Square, the location of the iconic statue of Thomas Telford, was officially opened on Thursday, 22 November 2018. 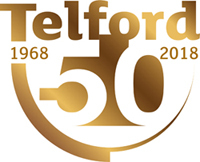 Last year the square and statue have undergone a major restoration as part of Telford’s 50th birthday celebrations, thanks to investment from the Council’s £2m Telford50 Legacy Fund. The restoration has been overseen by the Council with work carried out by local craftspeople and contractors, including Paul Kennedy Studios which re-patinated the figure of Thomas Telford. The much-loved statue of Thomas Telford is synonymous with Telford. The town was named after him, and wherever you see Telford mentioned, you are likely to see the sculpture. Cast in bronze and iron, the 3m high, 8m wide sculpture by sculptor Andre Wallace was unveiled in 1988. It depicts the figure of the great Thomas Telford in waistcoat, shirt and trousers leaning over the letter ‘o’ in Telford, holding a top hat in his hands, with his coat hanging on the letter ‘d’. The letters spelling out ‘Telford’ were originally painted in black and grey. As well as restoring the statue to its former glory, the water features have been reinstated, clock tower revamped, benches and bins refurbished, railings and fences repainted, lighting replaced and block paving re-laid and repointed. Cllr Richard Overton, Telford & Wrekin Council cabinet member for conservation and heritage, said: “2018 has been a fantastic year of celebrations for Telford. I have loved every minute, but for me this has to be a highlight. It really is wonderful to see the water features working and the statue looking so good. The fountain, which has been out of commission for around 10 years, was switched on to officially open the square. Allan Howard, principal architect at the former Telford Development Corporation flicked the switch. Here’s a link to a gallery of photos from the launch event. Allan’s memories of working on Telford Square, from inception to completion in 1988, are captured here. Thomas Telford (1757-1834), who the town is named after, was one of the key figures in the British industrial revolution. In 1787, he was appointed the Surveyor of Public Works for Shropshire and had a huge impact on the county’s infrastructure and architecture. In April 1988, a 3m high and 8m wide sculpture of the great man was unveiled in Telford Square as a tribute to the town’s namesake. Cast in bronze and iron, the sculpture by Andre Wallace shows the figure of Thomas Telford in waistcoat, shirt and trousers learning over the letter ‘o’ in Telford, holding a top hat in his hands, with his coat hanging on the letter ‘d’. When it was first unveiled, the bronze and iron statue was painted. The letters ‘T’ and ‘l’ and the full stop at the end were painted black and edged in light grey. The letters ‘e’, ‘f’ ‘o’, ‘r’ and ‘d’ were reversed; painted light grey and edged in black. Thomas Telford and his coat were also painted black. The weather has, however, taken its toll over the last 30 years, stripping away all traces of the original paintwork. In 2017, Telford & Wrekin Council asked people what legacy projects they would like to see happen during the anniversary year. Almost 1,400 people took part in the consultation and the most popular themes to emerge were heritage and tourism, arts and culture, and recreation. Many people also said they would like to see Telford Square spruced up as the area was looking tired and the statue a little weather-worn. Part of the issue with looking after the area has been that it has a number of different landowners. As the square provides an oasis away from the hubbub of the town centre and the much loved sculpture is part of the town’s heritage, Telford 50 legacy funding in the region of £100k has been set aside to improve the area and clean up the sculpture. as well as some general landscaping.